Size control of particles finer than 1 mm, are out of the practical range of conventional screens. Separation of such particles is carried out by classification. Classification implies the sorting of particulate material into different size ranges. It is a method of separation of fines from coarse particles and also lighter particles from heavier particles. The two product streams resulting from any classifiers are (i) a partially drained fraction containing the coarse particles, and (ii) a fine fraction of particles. Usually the principle of the classification is based upon the various densities, specific gravity, terminal falling velocities of particles in liquid and in air. Classification is defined as a method of separating mixtures of mineral particles into two or more products according to their settling velocities in water, in air or in other fluids. Classification is performed on the basis of the velocity with which the material particles fall through a fluid medium generally water or air. In view of the fact, that the velocity of particles in a fluid medium is dependent not only on the size, but also on the specific gravity and shape of the particles. In classifiers, use is made of the different rates of movement of particles of different sizes and densities suspended in a fluid and differentially affected by imposed forces such as gravity and centrifugal fields, by making suitable arrangements to collect the different fractions as they move to different regions. Based on their separation principles, classifiers are classified into two major types. They are (i) wet classifiers, and (ii) dry classifiers. Wet classification with hydro-cyclones using separation by centrifugal force typically covers the size range of 10 micrometers to 100 micrometers while wet classification with spiral classifiers using separation by gravity typically covers the size range of 100 micrometers to 1000 micrometers. Dry classification using separation by centrifugal force typically covers the range of 5 micrometers to 150 micrometers. Wet classifiers are based on the principle that separation of coarse particles from fine particles by liquid fluidization. The fundamental principle of wet classification is that coarse particles move faster than fine particles at equal density and high density particles move faster than low density particles at equal size. Further movement of the particle in the fluid can be either free movement or hindered movement. If a particle has no interference from other particles it moves faster than a particle surrounded by other particles due to increased density and viscosity of the slurry. This is called free and hindered movement and is valid both for gravity and centrifugal classification. Industrial classification may be carried out in different types of classifiers and these classifiers are normally (i) hydraulic classifiers, (ii) mechanical classifiers, and (iii) cyclones. Basically they all work according to the principle that the particles are suspended in water which has a slight upward movement relative to the particles. Particles below a certain size and density are carried away with the water-flow, whereas the coarser and heavier particles settle. Gravity settling tank is the simplest type of classifier. Here the separation is based on the influence of gravity and terminal falling velocity. Slurry with wide range of particles is given as feed. Heavier/coarse particles settle faster at the bottom near the inlet while fine particles are carried away in the outlet. Vertical baffles placed at various distances from the inlet within the tank allow for the collection of several fractions according to the terminal velocities. The very fine particles are carried away in the liquid overflow from the tank. These classifiers have low installation cost, no complex mechanism, and simple installation. However there is no sharp separation and separation efficiency is low. 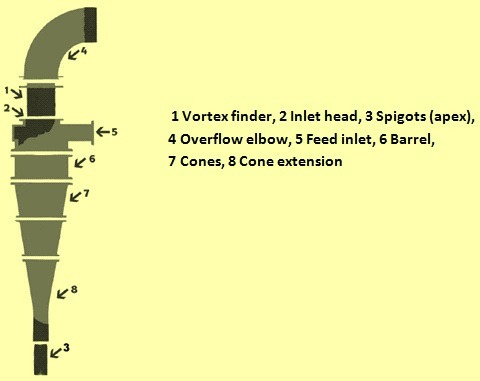 Cone classifier is simply a cone/conical vessel installed point down. It consists of a discharge launder around the top. The feed is introduced in the form of a suspension through a feed inlet provided at the centre at the top. The coarse particles collects at the point of the cone while the fine fraction along with the liquid is removed from launder as overflow. They are usually used in ore dressing plants. These classifiers have low cost of installation. However separation is only an approximate one in these classifiers and large feed cannot be given. Double cone classifier consists of a conical vessel inside of which there is a second hollow cone. The inner cone is slightly larger in angle arranged apex downwards and is movable in a vertical direction. The bottom portion of the inner cone is cut away and its position relative to the outer cone is regulated by a screw adjustment. The feed to be separated is fed in the form of a suspension to the centre of the inner cone. It flows downward through the inner cone and out at a baffle at the bottom of the inner cone. Hydraulic water (a stream of additional water supplied) is fed near the outlet for coarse particles. The solids from the inner cone and a rising stream of water are mixed below the inner cone and then flow through an annulus space between the two cones. Classification action occurs in the annular space, the fine particles are carried away in the overflow while the large particles settle against the hydraulic water to the bottom and are removed periodically. In the double cone classifiers, separation efficiency is comparatively high but the construction is little complex which makes it costly. Hydrocyclone classifier uses centrifugal forces to classify solids by size (mass). High mass particles move closer to outer wall reporting to underflow while the low mass particles move closer to the centre reporting to overflow. The application of a hydrocyclone is more than the size control. Although the hydrocyclone by nature is a size controlling machine the number of applications in mineral are many such as (i) classification in grinding circuits, (ii) dewatering and thickening, (iii) desliming and washing, (iv) enrichment of heavy minerals (dense media separation), and others. Fig 1 shows a typical hydrocyclone design. The spiral classifier is also a mechanical classifier. It is made by combining a gravity settler of rectangular section with a sloped transport spiral for the sediment. It consists of a semi cylindrical trough (a trough which is semi-circular in cross- section) inclined to the horizontal. The spiral conveyor moves the solids which settle to the bottom upward towards the top of the trough. Slurry is fed continuously near the middle of the trough. The slurry feed rate is so adjusted that fines do not have time to settle and are carried out with the overflow liquid. The proper combination of pool depth, area, and spiral construction result in controlled turbulence for accurate size separations or efficient washing or dewatering as desired. In these classifiers the required pool area is balanced with the sand raking capacity of the spiral by the design of the tank. Heavy particles have time to settle at the bottom and the spiral conveyor moves the settled particles upwards along the floor of the trough. Spiral classifiers are used for close circuit grinding. There are three designs of semi cylindrical troughs are available as shown in Fig 2. Straight side design is generally suitable for coarse separations. Modified flare design increases pool area for intermediate to fine separations and for washing and dewatering. Full flare design provides maximum pool area for fine to very fine separations and for washing and dewatering where large volumes of water are to be handled. Spiral can be of single pitch or double pitch. Single pitch spirals consist of one continuous spiral ribbon. The double pitch spiral has twice the raking capacity of a single pitch assembly and consists of two duplicate spiral ribbons. Rake classifier is a mechanical classifier consists of a rectangular tank with a sloping/inclined bottom. The tank is provided with movable rakes. The feed in the form of a suspension is introduced continuously near the middle of the tank. The lower end of the tank has a weir overflow from which the fines that are not settled leave with the overflow liquid. The heavy materials sink to the bottom of the tank. The rakes scrap the settled solids upwards along the bottom of the tank to the top of the tank. The reciprocating rakes keep the slurry in continuous agitation. The time of raking stroke is so adjusted that fines do not have time to settle and so remain near the surface of the slurry while the heavy particles have time to settle. Rake classifiers are also used for close circuit grinding. Both rake and spiral classifiers are more efficient in classifying the coarse particles. But they are very costly for installation. In these classifiers the separation achieved is distinct. Dry classifiers are based on the principle that separation by air fluidization. Air classification is a process of separating categories of materials by way of differences in their respective aerodynamic characteristics. The aerodynamic characteristic of a particular material is primarily a function of the size, geometry, and density of the particles. The process consists of the interaction of a moving stream of air, material particles, and the gravitational force within a confined volume. In the interaction, the drag force and the gravitational force are exerted in different directions upon the material particles. The result is that material particles that have a large drag-to weight ratio are suspended in the air stream, whereas components that have a small ratio tend to settle out of the air stream. The suspended fraction conventionally is referred to as the ‘air classified light fraction’ and the settled fraction is termed ‘air-classified heavy fraction’. The confined volume in which the separation takes place is called an ‘air classifier’. The density of a material is not the only characteristic of a particle that affects the air classification process. Moisture affects the separation as a result of its influence on the density of a material particle. Air classifiers may be one of a number of designs. The three principal groups of designs are horizontal, inclined, and vertical. All three require appropriate dust collection, blower, separator, and control facilities. The static and dynamic air classifiers offer solutions in combination with ancillary equipment to meet the demands of almost any dry separation requirement. A wide range of separations are available from 12 mesh size (1.4 mm) down to 1250 mesh (10 micrometer) with separation efficiencies of up to 95 %. Classifier throughputs range from very small units to applications processing hundreds of tons per hour. Application, feed type, fineness of classification and classification accuracy required influence the allowable moisture in the feed which typically ranges from 2.5 % to below 1 % dependant on the process. The static and dynamic classifiers offer tailored solutions for a wide range of applications. These classifiers are typically used for material classification in the mining, construction, industrial minerals, cement and pozzolan materials, and chemical industries. Static air classifiers achieve accurate separations from 12 mesh size (1.4 mm) to 20 (micrometer). The static air classifiers are designed to achieve extremely accurate separations even though they contain no moving elements in the airstream. This is achieved through airflow design and use of recirculating, secondary airflow on finer separations to scrub the coarse product before it is discharged. The recirculating airflow is adjustable so the amount of undersize retained is also adjustable. This provides fine tuning of the end products so exact product specifications can be achieved. The design of the recirculating systems mean that adjustments can be done during production and results are instant. The static design of these classifiers offers excellent wear characteristics through the use of ceramic linings whose lifetimes are measured in years, low maintenance requirements and low power consumption. The gravitational classifiers are designed for coarser separations in the range of 12 mesh size (1.4 mm) to 100 mesh size (150 micrometers). The feed material is spread over the width of the classifier and drops as a continuous feed curtain through the top of the classifier. Low velocity air enters the classifier through the front inlet and is drawn through the feed curtain which is dropping in front of the angled vanes on the air outlet. The air stream enters the feed curtain perpendicularly and draws the finer particles from the curtain of material. The air current then draws the particles up almost vertical through the vane rack. Gravitational classifiers are suitable for close grinding circuits, de-dusting of coarser feeds, reducing a high feed loading rate to a finer classifier and it can also be used as a density separator if the specific gravity difference of the product to waste ratio is greater than 5. Gravitational inertial classifiers combine gravitational, inertial, centrifugal and aerodynamic forces to achieve separations from 50 mesh size (300 micrometer) to 230 mesh size (63 micrometer). The feed material is spread over the width of the classifier and drops as a continuous feed curtain through the top of the classifier. The primary air also enters the top of the classifier in a downward direction with the feed. The air is drawn through the feed curtain and then through a 120 degree change in direction and exits through the vanes carrying undersize particles with it. The coarser particles that are not drawn away drop down to where a secondary air flow is drawn into the classifier. The coarse particle curtain is scrubbed by this secondary air with the finer fraction being drawn by the secondary airflow back into the primary feed curtain. By making simple adjustments to the secondary air damper the end products can be modified. As there are no moving parts within the material flow stream significantly reduces maintenance requirements. Use of ceramic lining throughout the classifier gives impressive wear resistance. The centrifugal classifier utilizes centrifugal forces in a similar way to cyclones to induce fine particle separation. The classifier is capable of separations in the range of 140 mesh size (100 micrometer) to 800 mesh size (15 micrometer). The classifier has widespread acceptance in industrial minerals, cement and fly ash applications. It has high degree of separation accuracy and exceptionally low maintenance requirements. The classifier is used in conjunction with a dust collector and system fan. Systems can have an open or closed loop dependant on application and numerous dust collector and silo storage options. Cyclonic ultrafine classifier is a specially designed high efficiency cyclonic classifiers with controllable reverse air flow systems. This classifier can achieve adjustable ultrafine classifications. The cyclonic ultrafine classifier is a hybrid air cyclone that combines cyclone and classifier designs to separate very fine particles. In conventional air cyclones, the aim is to remove as much of the particulate from the airstream as possible. However the cyclonic ultrafine classifier is designed to allow the finest particles to be removed in the ascending vortex. This separation is achieved by introducing a reverse airflow into the specially designed disengaging hopper that weakens the descending vortex and creates a stronger entraining force in the ascending vortex that draws the required particles away to the fines collector. Control of the separation point is achieved by varying the percentage of reverse airflow relative to the total air. The cyclonic ultrafine classifier is designed to achieve separations in the region of 270 mesh size (50 micrometer) to 1250 mesh size (10 micrometer) with a top feed size of 4 mesh size ( 5mm). The cyclonic ultrafine classifiers are very low maintenance even on highly abrasive feeds. The unit contains no moving parts and adjustments can be made on-line. The dynamic air classifiers are built to suit a range of applications and systems and have been often installed on air swept mills circuits. The rotating vane air classifier separates dry, solid, homogenous particles by size. It utilizes a rotating vane to separate dry solid particles by size for separations for 35 mesh size (500 micrometer) to 325 mesh size (45 micrometer). This classifier can be integrated into a conventional closed or open dry grinding circuit. It can also be utilized in a classification only system complete with cyclone, fan, dust collector and rotary air locks. Delta sizers are designed for accurate separation of dry feeds at high efficiency and low power consumption on a continuous basis. It can be integrated into a conventional closed or open dry grinding circuit, or utilized in a classification only system complete with cyclone, fan, dust collector and rotary air locks. High efficiency cyclone technologies are specifically tailored to the needs of the mining, industrial mineral and construction industries. The high efficiency cyclones are the product of significant development with the aim of achieving extremely high levels of particle removal from the airstream. The inlet scroll is normally designed with a smooth flow elbow to eliminate currents perpendicular to the main direction of gas flow that is present in standard conventional rectangular entrance cyclones. Custom designed disengaging hoppers give high efficient separations by creating a void that hosts the bottom section of the descending vortex and allows the particles to disengage from the airstream before it ascends the gas outlet tube.